Spring is well under way as a new release of AceProject with many exciting enhancements. In this latest release, a new Quick Add button menu and restructuring on the top right zone of the application. Now, no matter where you are in the application, it is always just a click away to add what you need to. Also, the Task Gantt chart has been upgraded adding on to last months modifications. Check out also the many improvements and bug fixes that have been done throughout the application. View the following video showing the Gantt chart changes, the “me” variable for reporting purposes, and more. All those Administrators out there! Don’t worry the Administration button is not missing, it has simply been placed under the Settings/Gear icon on the top right. No matter where you are in the application, you now have one centralized area to add tasks, time, users, an expense, a client and timeclock. If you are already in a project, the tasks, expense, etc will be set to place the item within it. 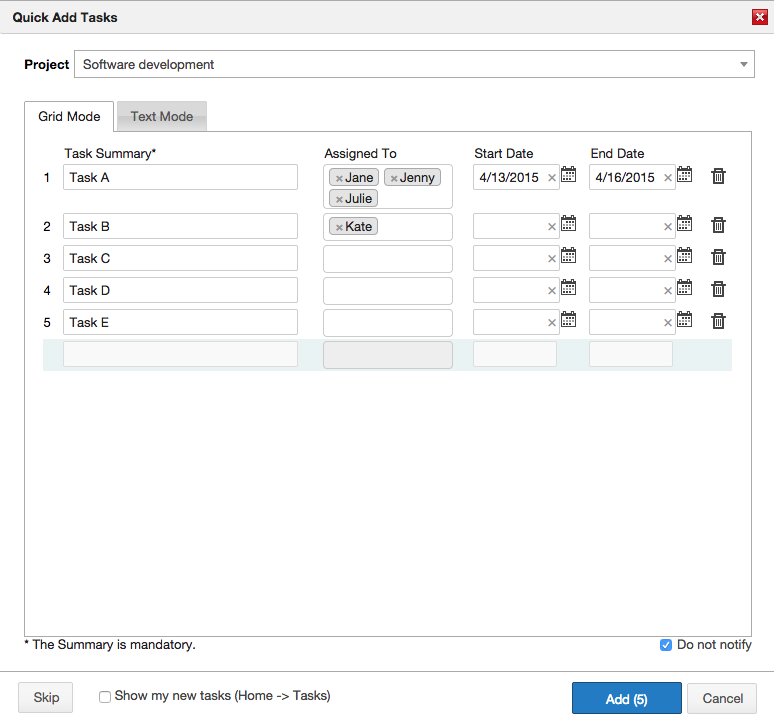 From this menu is accessible a completely new Add Tasks functionality that allows to create multiple tasks at once, saving a lot of time. A continued effort was made to make the Gantt chart function even better. One of the bigger changes is that now the Task Gantt is available at the individual Project level with project level filters. There is a today marker to easily place yourself in the time context. To navigate easier an infinite horizontal scroll was implemented as well as a scroll effect when you select and move an item to the edge of the chart. The export to .PNG of the chart now also includes the dependency lines that were previously missing. One fairly large improvement that you may likely use is that the grid portion of the Gantt chart is mostly dynamically editable. You can quick change task summaries, dates, progression, etc, directly within the grid. Try it out! Throughout the application you will notice in the drop-down user combo boxes an item called “me (username)”. Not only is it very practical in finding yourself, but also to set as a variable in your reports. 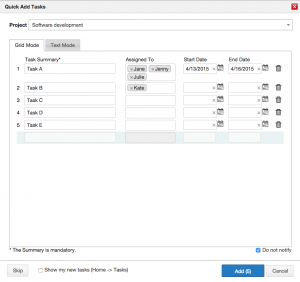 No more making 20 different custom task reports for 20 users. Simply set the user to “Me” and each user in their own account will execute the report and will show those tasks related to the user. AceProject now allows the Administrator whether to enforce or not “strong” passwords. Strong passwords are those that must be at least 7 characters long, and contain at least 3 of the following 4: one uppercase letter, 1 lowercase lettter, a digit and a special symbol. As well, the previous password cannot be repeated. By default, this option is turned off. If turned on, upon next entry into AceProject, the user will be requested to modify the existing password. Password Expiration: An Administrator can also set the amount of time between expiring the existing password. A value of 0 means it never expires. This can be used in combination with the Strong password or independently from it. Good job, c’est vraiment cool un produit qui progresse. Lâcher pas le bon travail. Aceproject est notre plus belle découverte de 2015. Happy to see the continual evolution of this user friendly scheduling tool. The new Gantt view really enhances the functionality, making this the most flexible project planning & forecasting app. in my toolbox. Kudos to the Dev Team!